Economically priced entry system for above ground swimming pools meets all codes & entrapment regulations. This rugged step with ladder entry system is all you need to enter and exit your pool if your above ground swimming pool does not have a deck. The Easy Pool Step system features our rugged step that will fit any pool up to 54” deep; and makes getting out of your pool easy and safe. Attached to the step is our classic ladder that swings up and can be locked for safety. 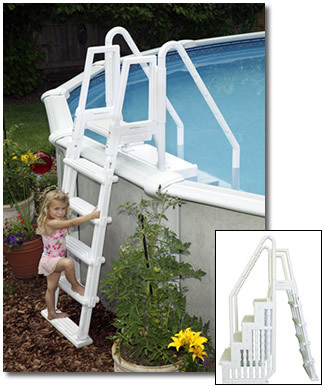 Both the Easy Pool Step and the classic ladder can support up to a 300 pound swimmer. They are made of corrosion-proof polyethylene for years and years of use. The step and ladder system is easy to install and operate. The step and ladder entry system is backed by a 3 year manufacturer prorated warranty. Optional 2'x3' Ladder Pad goes under the steps and is a great way to protect your liner. Assembly required and you will need about 40 pounds of sand to pour through posts to provide stability.